The My Nursery Rhymes Pack is a revised version of the two previous programs based around nursery rhymes: Nursery Rhymes Program and Nursery Rhymes for Young Children. It combines the whole class activities, which only require minimal set-up support materials, but also offers the follow-up individual or home-based activities for those children who require some extra practice in developing these skills. 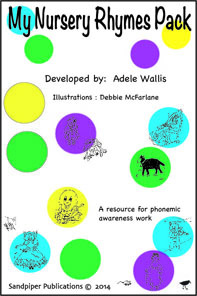 The activities support the key areas of phonemic awareness: rhyming, syllabification, identifying initial and final sounds, word segmenting, and sound blending. 3 or 4 more activities which have been written more towards individual practice. There is enough instruction provided in these resources for a teacher aide or parent to work through with children - either individually or in small groups. All activities have the necessary support materials in the program provided as black line masters.